Most advertising today is done online. A well-made website can be a showcase for the high quality work you are producing. However, when a website is out of date, it diminishes the value of the craftsmanship your prospective customer sees. Nowadays, it’s super important to keep your website up to best practices with regular updates. Keep in mind how you present messaging on your website. A web presence can help establish a niche for your company, whether that be a specific visual style or high material quality. Without a hook to attract customers, a lot of print shops are forced to compete on lowest price. Being able to present your company as the print shop with the highest quality banners can actually increase sales with better margins. In addition, make sure the information you put up online is up to date and accurate. That applies to both your company website and information portals like Google and Yelp. When the difference between you and the competition is slim, a disconnected phone number or dead email address can be the difference between a new client and a lost opportunity. Search engine results influence a lot of buying decisions. SEO describes the tactics that companies can use to establish good page position on Google, Bing, and other popular search engines. That page position is determined by a number of factors, including everything from webpage response times to backlinks and more. SEO can be highly technical, but any company can keep their website up to date with best practices on the basics. Online tests are available to give your site an overview, and tell you the basics of what you need to update. From there, you have a lot of options to secure page positioning, including a content strategy, securing listings on directories, link building, and more. Print shops can generate a lot of business by maintaining an engaging social media presence. Marketing on social media requires more than just posting on Facebook and Twitter, though. Like any other marketing outlet, it requires planning. Social media platforms use algorithms that intend to give people more of the content they want — and less of what they don’t. For companies, that’s a tough prospect… most people don’t go on Facebook to see ads. For this reason, the algorithm usually de-prioritizes content from companies and brands. One essential way around that is using paid ads. Paid ads on social media are affordable when compared to more traditional advertising channels.They’re also a key part of any successful social media marketing strategy. You can spend hours online trying to generate the same amount of views or new followers that a small ad investment can do automatically. When developing your marketing plan, remember to brush up on the current best use guidelines for each platform. Review the image size recommendations each platform provides users to ensure that the imagery you post is the highest possible resolution. Above all, engage with your audience — it’s called “social” media for a reason. Putting your message out into the world is only part of the experience. Of course, not all of your advertising should be done online. Curb appeal is still a valuable draw for customers, especially in walkable areas. In order to draw in foot traffic, you need strong messaging on the exterior of your shop. Thankfully, strong visual messaging is what print shops do. Printed banners are an effective marketing tactic for most brick-and-mortar companies, but they are especially valuable for print companies. After all, you are getting your messaging out both with what you print and how you print it. Making a big impression is equal parts creative design prowess and high quality materials. 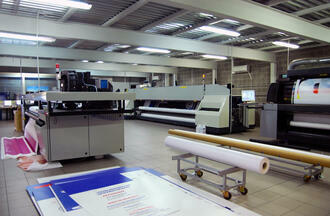 Using a high quality banner print media will produce better image quality. Outdoor messaging should be bright, clear, and easy to read. Banners and signage should reflect the personality of your brand. Reach out to local charities and see if they need print services. Many will allow you to include a small company logo on the corner of a banner in exchange for free or discounted work, which helps build a positive association with your brand. Charity partnerships can help drive referrals from other local organizations and small businesses in the process. Companies that are part of the community get support from that community. When you provide goods and services to local charities, it also gives you and your employees the satisfaction of knowing your work is benefiting others. Direct mail has been a popular advertising method for a number of years. Many marketers operate on the incorrect assumption that it no longer has the same clout in the digital age. In fact, direct mail and flyering might be more effective because of the ubiquity of digital advertising. People don’t get mail as often — and tend to pay attention when they do. Experiment with print-centric marketing approaches and play to your strengths as a company. Marketing isn’t always easy, but it’s essential for growing your print shop. Thankfully, there are several approaches available to shop owners today, many of which allow you to tweak your messaging and build your brand in the process. Learn how to find the right banner material supplier for your needs.